CINCINNATI - Heather Bleh knows what retail is like when you're off the beaten path. The owner of the Avril-Bleh Sandwich Shop on Court Street is often “discovered” by customers who work nearby but never knew about her homemade soups and salads. “They’re like, ‘How long have you guys been here?’ We tell them, ‘Going on 10 years.’ And they’re like, ‘Really?’ That’s kind of a daily occurrence around here,” she said. The deli survives on loyal lunch and catering customers, the courthouse crowd and employees who venture out of Kroger’s headquarters on good weather days. But those crowds are gone by 4 p.m., when the surface lots empty and vacant storefronts tell passersby that Court Street is closed for business. Bleh gave up on the dinner trade years ago. 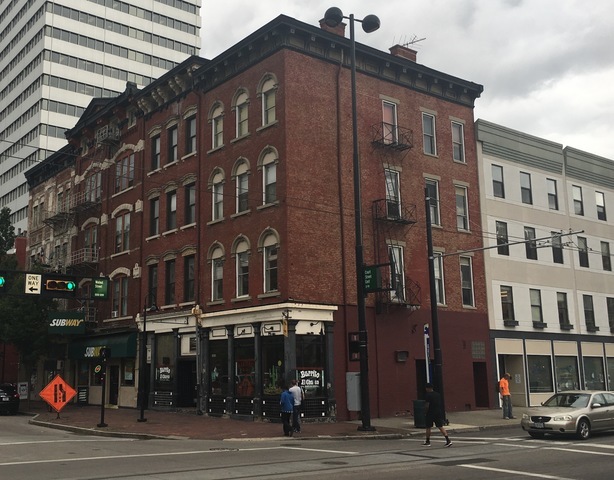 That’s why she welcomed Tuesday’s news that a Downtown Kroger store will anchor a $90.5 million housing development at Court and Walnut streets. “It’ll get people coming to this area more often,” she said. Several speakers talked about the Court Street business district at Tuesday’s press conference announcing the project. The Cincinnati Center City Development Corp., or 3CDC, said there is 52,000 square feet of vacant storefront space within two blocks of the site where Kroger plans to build a two-story grocery store, topped by an eight-story garage and 139 luxury apartment units. They’re hoping the project will bridge the gap between the bustling blocks near Washington Park to the crowded corners south and east of Fountain Square. “We concur with 3CDC that the Court Street corridor has kind of become a dead zone,” said apartment developer Rick Kimbler, whose NorthPointe Properties is one of three residential partners in the 18-story tower. Catty corner to the planned Kroger site, changes are already afoot. Retail broker Patrick Metz said a Memphis-based fried chicken chain has leased the former Servatii Pastry Shop at Court and Walnut, subject to permits and other contingencies. Metz said it would be the first area location for Gus’s World Famous Fried Chicken, a family-owned chain known for its spicy batter and for making Yelp’s list of the nation’s top 100 places to eat. Gus’s did not respond to WCPO’s email. Its website lists Cincinnati and Houston as two markets it plans to enter, but doesn’t provide other details. 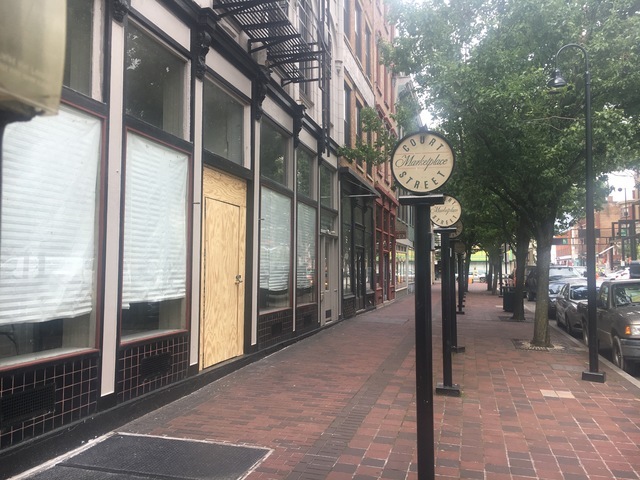 Metz thinks the Court Street business district will be the next wave for Downtown development. Real estate investor Jim Daffin agrees. Daffin paid $225,000 in 2015 for a four-story apartment building at 28 West Court Street. Then, he remodeled and re-leased its 12 apartments and two retail spaces. His sons, Nick and Patrick, opened a bar in one of the spaces. Queen City Exchange sells craft beer like the stock market: The price rises with customer demand. Daffin sees the same potential for his building. It may not be good for everyone. Daffin said he got a call from a Court Street hair stylist who told him her lease would be terminated so the space can be redeveloped. And rumors are swirling on the street about what’s next for a cluster of buildings owned by North South Properties LLC. It paid $3.3 million to buy most of the block between Kroger’s headquarters and the site of the new grocery store. CEO Rodney McMullen told WCPO that Kroger has no immediate plans for the North South Properties parcels. Daffin is convinced the site was assembled by 3CDC as a way to broaden the impact of the Court and Walnut development. A spokesman for 3CDC did not return WCPO’s inquiry on the North South parcels. Cincinnati Mayor John Cranley didn’t comment on specific sites, but broadly endorsed 3CDC’s goal of expanding the impact of Tuesday’s big Kroger news.